Even saying the word “asynchronous” aloud is likely to make you feel like a pointy-headed geek with a pocket pencil protector and scientific calculator. Don’t worry so much about appearances. Asynchronous communication is just a phrase used to describe the most amazing advantage podcasting holds over other forms of media. To get down to the nuts and bolts of the concept, podcasting occurs intermittently (asynchronous) rather than in a steady stream. Perhaps the best way to get a grasp on what asynchronous communication entails is to look at a few familiar examples of what it isn’t. The old-fashioned world of radio and television broadcasting? Very definitely NOT asynchronous. In an odd sort of way, newspaper and other forms of print publishing have more in common with podcasting than do radio or television, though the idea of applying thoughts to dead trees is fast becoming anachronistic. To put it simply, podcasting allows the podcaster to record and upload his content any time he wants. Likewise, listeners are free to download and listen to content any time they want. This is the idea of asynchronicity. The old rules of broadcaster and listener or viewer gathering at the same time are out the window. Timing is irrelevant. Creators’ create on their own schedule, consumers consume on theirs. Everybody’s happy. Remember the old days of scheduling daily activities around the broadcast schedule of a monolithic corporation that really didn’t have to concern itself with whether or not you liked the fact that the evenings news came on at 6 o’clock? THEY wanted it on then so that was darn well when it was going to happen. 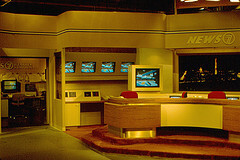 In order to view the evening news, you WOULD be in your armchair in the living room at 6 o’clock or forget it. Though we at Speaking of Wealth tend to focus on podcasting, since it’s our favorite medium, the advantages of asynchronous communication can be seen taking hold in a variety of areas. While the technology for recording video has been with us for a while, recent advances in the availability of DVR (digital video recorder) units has made the process of watching television on an individual schedule so much easier. And you can fast forward through the commercials, which is a bonus sent directly from heaven. Applied to the satellite or cable television industry, asynchronous communication allows the recording of 100 hours or more of whatever the heck we want, and watch it at our leisure. All this thanks to the miracle of digital encoding and playback. This brings up another advantage to asynchronicity. Once recorded and posted, the content is there forever, theoretically free to be discovered and downloaded for eternity. This is a pretty big deal for both podcaster and listener. Viewed from a completely mercenary perspective, podcasts sit there online like tiny little ATM machines, carrying the particular content or sales message of the episode to anyone who stumbles across it, whether it be five minutes from now or five years. Listeners now have literally forever (or at least as long as they live and Al Gore can keep the Internet running) to discover and become new fans of material. Imagine if we had podcast episodes of Edgar Allen Poe reading his own works aloud, or live audio from George Washington’s inaugural addresses. Pretty cool idea, huh? Well that’s what future generations have to look forward to. Today’s history-makers and celebrity icons will live on forever in a way never imagined in years past, thanks to asynchronous communication. These recent developments in mass media consumption have also helped level the playing field when it comes to the relative power of broadcaster and consumer. In days past, how common was it for NBC to listen to one lonely voice crying in the wilderness that their situation comedy writing team was producing absolute crap? Not very. Corporations rarely paid attention to a complaining consumer because they didn’t have to. It took a titanic wave of organization and dedication in order to create even the tiniest ripple in their awareness. No longer! In this day of email, social media, forums, blogs, etc it is a foolish business that thinks it can wield heavy-handed power and ignore consumer opinions. CEO’s and marketing executives are scrambling to establish a benevolent presence in social media outlets. They know it’s a new game now and, if not actually quaking in their boots, are at least painfully aware they no longer have the upper hand. They MUST be responsive to listener and viewer demands, and that’s good for everyone.